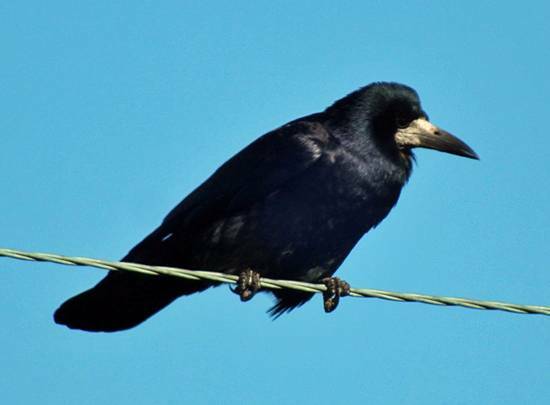 Rooks are the most sociable of the crows; they feed and flock together and their communal nesting areas, known as rookeries, can include a great many birds. Rooks feed mainly on the ground, eating wireworms, leather jackets (larvae of the Large Cranefly) and eggs, as well as some seeds. Rooks will also try to steal any large pieces of food from your bird table before the smaller birds have a chance to feed. The whitish patch around the base of a Rook's bill is a helpful identifying feature. Rooks build their nests using sticks and mud, and they line them with grass, wool and animal hair. A typical clutch of eggs, which are usually laid in March, is between three and six; they are greenish with olive-brown mottling.